Noted ginseng expert, Robert Beyfuss, will give a talk about American Ginseng (panax quinquefolius) and its history in North America, on Thursday, July 28, 2016. The meeting will be held at the Sylvan Lodge Masonic Hall, 159 Main Street, Moravia starting at 6:30 pm. The meeting is free and open to the public. Of all the crops that our local farmers have tried over the years, probably none are as challenging and misunderstood as ginseng. American Indians in our area knew of the plant from ancient times and began trading it with French missionaries in the early 1700’s, who in turn made a profit by sending the roots to China. Much later, a craze swept through our area beginning in the 1880s. The story is best told by Samuel Hopkins Adams in an article called “The Treasure Hunt” that first appeared in the January 16, 1954 issue of The New Yorker magazine. The article later was published as a chapter in Adam’s best-selling book, Grandfather Stories. In his story Adams tells of discovering a wild ginseng plant in 1884 in the woods near his grandfather’s camp on Owasco Lake. He and his cousins began trading with Frank Clark, the station master at Ensenore, who shipped the plants to Chinese dealers in New York. By the end of the first summer the cousins had sold over $20 in wild roots to Clark. They weren’t the only ones engaging in the practice and within a few years the wild form of the plant had virtually become extinct. Today ginseng is categorized as exploitably vulnerable on New York State’s list of protected native plants. Local gardeners and farmers made several attempts at growing the plant, but most were unsuccessful and soon moved on to other ventures. Among those who prevailed was local entrepreneur Arthur J. “Sandy” Bowen. 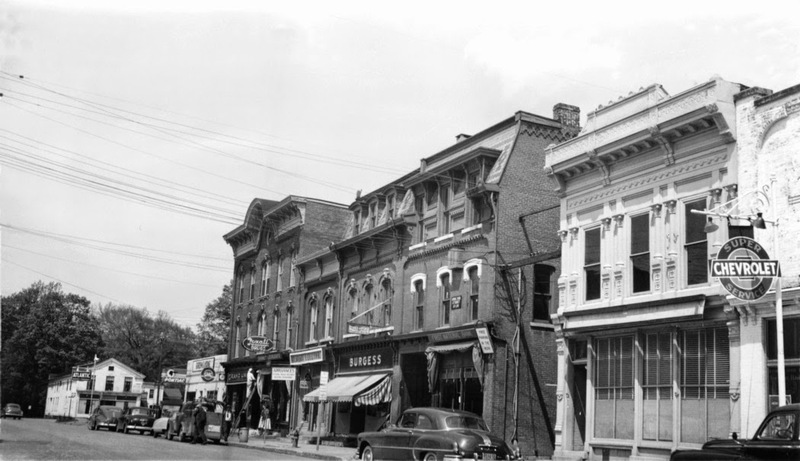 Born in Montville in 1868, Arthur went into the blacksmith trade at age 17, later operating his own business on East Cayuga Street in Moravia. 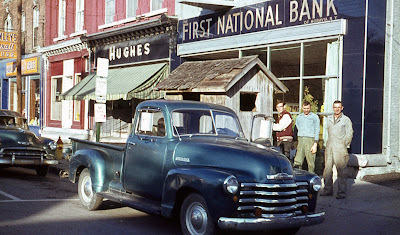 His blacksmith shop became a general wagon repair shop, which later evolved into an auto repair shop and gas station that he operated along with his son Carl. The building has recently collapsed and is in the process of being removed. Probably the most ambitious of Arthur’s various projects were his ginseng gardens. Not only did he sell thousands of seed roots to traders from Japan, China and Korea, he supplied other growers across the country and published articles and pamphlets on the subject. Using original 1910 photos from the COLHS research library, Mr. Beyfuss and COLHS member Roger Phillips were able to locate and visit the site of Bowen's former operation on Dresserville Road in Montville. Mr. Beyfuss retired from Cornell University Cooperative Extension of Greene County in 2009, where he served as the Agriculture and Natural Resources Program Leader and also as the NY State specialist for American Ginseng Production for Cornell University. He is the author of several papers about ginseng including "American Ginseng Production in NY State", "The Practical Guide to Growing Ginseng", "Ginseng Production in Woodlots" and "The Economics of Woodland Ginseng Production." Mr. Beyfuss currently manages 220 acres of forestland, where wild simulated ginseng is being grown in the Catskill Mountain region of NY State. Members of the Cayuga-Owasco Lakes Historical Society celebrated the organization's fiftieth anniversary at its annual banquet last week. By sheer coincidence the April 28th event fell on the same date that the group's name was chosen and first permanent officers were elected in 1966. Some attendees dressed for the occasion as they would have in 1966. 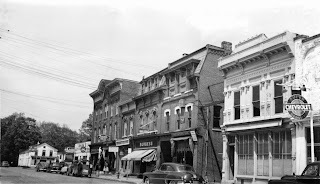 Roger Stoyell wore his army uniform; Esther Thornton came as a flower child and Millie Redmond dressed in her "Sunday best" including hat, big pocketbook and pumps. 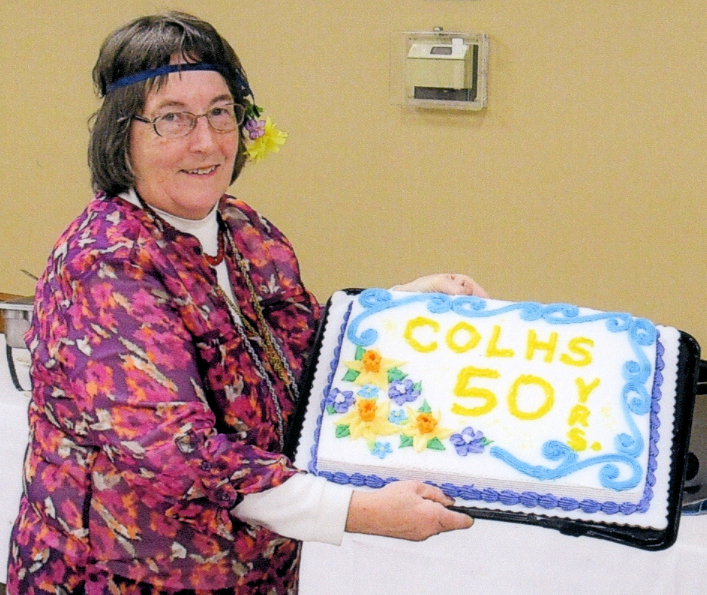 Roger Phillips reviewed news from 1966 to help place the founding of COLHS in context. Retired County Historian and long-time COLHS member Tom Eldred spoke about the early days of COLHS and some of the early members including Bob Scarry, Mabel Crosby, Elsie VanLiew and Don Mortin. Officers elected for 2016 are Bill O'Connor III, President; Ken Morehouse, 1st Vice-President; Sean Cochrane, 2nd Vice-President; Esther Thornton, Secretary and Roger Phillips, Treasurer. So how long have their been "Friends of Fillmore Glen?" It turns out the Dry Creek Gorge was popular long before the name Fillmore Glen was coined. The following article from the Moravia Valley Register of June 26, 1874 provides a colorful description of what is now Fillmore Glen State Park. Mr. Editor – As an excellent opportunity presents itself just now for the purpose of describing the beauty and grandeur of Nature, I will make a rough attempt to describe a grand precipice, known to the people of Moravia and vicinity, as “The Pinnacle.” But first, let us begin at the lower part, or end of the stream upon which this stone structure is situated. The stream is know as “Dry Creek,” from the fact that during the greater part of the summer season scarcely any water can be seen to flow there. We begin at that portion of the creek east of Mr. Jacob Adam’s house, and follow it in a south easterly direction, to the foot of what is termed, “Dry Falls.” Here we stop and gaze at the mighty rocks and high banks, on either side, covered with small trees and vines. At our left, and in front, as we look east, our eyes meet with a large indenture, in the rocky side of the bank, of about 30 feet. At the top a huge rock projects, like a cover of a shed, which slopes back to the summit of the bank. Clear cold water is constantly dripping from the edge of this shed. We clamber up the irregular side of this gorge, and try to cut our name higher than those who have tried before us; at last we give up, discouraged, and descend to safer and more solid ground. Our mind is much excited at what we have had in view. Now, in our admiration, we turn to the right, and before us are the Falls; the water dashing and splashing down over the green covered rocks, striking the huge, pointed rocks beneath, and then moves on with the same musical sound as before. At the top a wooden bridge spans the stream, builded [sic] for the purpose of transferring wood and logs across. We climb up the steep, scrubby bank, and pass onto this bridge. Here we pause to rest and view the beauties of Nature. On either side, the high, and almost perpendicular banks rise, covered by trees and bushes, quite shutting out the rays of the sun whose only change to visit this place is when it is directly overhead. Above us, the stream turns abruptly to the left, and is lost from view. Below, our imagination is thoroughly realized. Our eyes follow the winding stream until it is lost to sight. The green pastures, with trees scattered here and there; the cattle grazing; a lonely cemetery, with the stream winding around the base; the hills beyond, thickly studded with wood, can all be seen from this point. But the sun is trailing the western horizon, and reminds us of the journey before us. We descend from the bridge and proceed eastward, following the bed of the creek. As we round the bluff, we can see far up the stream. The creek is thickly dotted with stones, so our progress is not hindered by the water. In a little pool we see small fish darting here and there, some seeking refuge under stones, others at a loss where to go. On either side, for two miles the ground recedes very sharply, for an average of 40 feet, then abruptly spreads onto level fields. We proceed. At last we arrive at the ruins of an old and dilapidated saw mill. A part of the bulkhead is still in existence and the main timbers are not quite destroyed by time, and exposure to the weather. Underneath, the bushes and breaks seek safety; no saw meets the eye; pieces of iron are scattered here and there, being slowly and surely burned up by Nature, is all. On our left, the trees disappear giving place to shrubs and briar bushes. We leave the ruined mill and pass on. Nothing of much interest presents itself, save the growing density of the wood, and the contraction of the gorge. At last a new sound greets the ear – the sound of falling water. We increase our footsteps; the sound grows louder and the widths of the gulf decreases, the sides growing more and more perpendicular. At our left, a little stream comes singing and dancing from the fields beyond, and suddenly is precipitated over a perpendicular precipice, until it meets the larger stream below, and then goes on as gay as ever. We pause but a moment here, but pass on. The gorge grows deeper. We clamber up the side of a fall of ten or more feet, and lift our eyes heavenward. On either side are perpendicular walls of solid stone, over one hundred feet high, towering toward the sky. No shrub can grow on this rocky cliff, until near its top; then a few bushes cling as if in fear, to its brink; this is “The Pinnacle.” On the east side of the stream is an indenture large enough for a medium sized man to stand. This is disfigured by the names of different persons, and of different dates, which are chiseled in the stone. We cast ourselves on the shady ground and rest. Soon we are warned of the rapid approaching of night, and we regain our feet, find our way out of this deep ravine, and turn our faces homeward. COLHS will hold its sixth annual Pioneer Day event on Saturday, August 8, 2015, from 10:00 am until 3:00 pm. All events are open to the public and free of charge. THE HISTORY HOUSE at 14 West Cayuga Street, Moravia, will feature artisan demonstrations, a Petting Zoo with Alpacas and Miniature Donkeys, Snacks and Raffles. Several historic quilts from the COLHS collection will be on display this year in the main exhibit room. Artisan demonstrations will include: Deer Horn Knives, Chair Decorating, Chair Caning, Quilt Making, Rug Making, Needlework, Knitting, Crocheting, Butter Making, Soap Making, Spinning, Antique Tool Demonstrations and Black Powder Guns. Several baskets, each loaded with about $200 in merchandise and gift certificates from area businesses will be available for raffles. As always, a highlight of the event will be a homemade pie sale. Hot dogs and other refreshments will be provided by 10-10 BBQ. In addition to the planned demonstrations, several area artisans will have booths with their handiwork for sale. If you are an artisan and would like to reserve a space, please send an email or call Esther at 315-497-0537. SYLVAN LODGE MASONIC LODGE at 159 Main Street, Moravia, will feature the Dr. Anthony Fine Art and Photography Contests. Both contests are open to all ages, amateur or professional. Click here for rules and registration forms. In addition to art and photography submitted for the show, several works by Dr. H.E. Anthony will also be on display along with some of his memorabilia. Dr. Anthony was one of Moravia's country doctors for sixty years. He also was a prolific artist and playwright. COLHS houses a large collection of Dr. Anthony's paintings, scripts and memorabilia. Click here to read more about Dr. Anthony. The Owasco Reformed Church Guild in Owasco Village will host a Ham dinner for the annual banquet of the Cayuga-Owasco Lakes Historical Society at their church on Thursday April 23 at 6 p.m.
Members and their guests are invited to attend and help the Church celebrate the 200th year of the building that is on the State and National Historic Register. The Church building was completed in 1815, by the pioneers of Owasco. After the dinner, there will be a brief program in the sanctuary by Irene Ward and Laurel Auchampaugh, the Owasco Historian. The church is located in the hamlet of Owasco at 5105 State Route 38A, near the intersection with Gahwiler Road. The cost of the dinner is $12 per person. To make a reservation, please contact Esther Thornton no later than April 16, 2015 at 315-497-0537 or send an email. Spring hours are now in effect. Currently the History House is open Mondays from 9am to noon. Starting Saturday, May 30, the History House will be open each Saturday from 10am until 2pm (subject to the availability of volunteers).